Sgt Joe Friday and his partner Officer Smith investigate a wide range of crimes and criminal activities in 1950's Los Angeles. Dragnet aired for eight seasons, from 1951 - 1959 and won 3 time primetime Emmy Awards during its eight year run. Jack Webb directed the show and also starred as Sgt Joe Friday alongside a number of frequently changing partners. 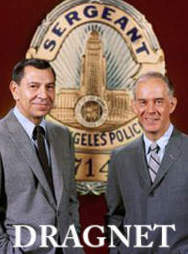 Dragnet was later revived in 1967 for four seasons and in 2003 for two more seasons.